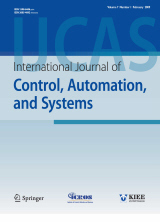 Abstract : "In this paper, finite-time global synchronization control problem for a class of nonlinear coupling Markovian switched complex networks (NCMSCNs) is investigated. Furthermore, according to differentiability of nonlinear coupling function g(x;y), g(x;y) how to affect synchronization dynamics of the class of NCMSCNs is analyzed by two viewpoints. The first is that if g(x;y) satisfies the Lipschitz condition and is derivable, the above question is discussed by taking g(x;y) = L1x+L2y, g(x;y) =  L1x+L2y, g(x;y) = L1x L2y and g(x;y) =  L1x L2y, where L1 > 0, L2 > 0. The second is that if nonlinear coupling function g(x;y) only satisfies the Lipschitz condition, by analyzing the differences of synchronization control rules for the class of NCMSCNs and a class of linear coupling Markovian switched complex networks (LCMSCNs), the problem is explored. Comparing the previous works [12,21,22,26,33,34], the main improvement of this paper is that the works of this paper extend the existed analyzing ideas of the finite-time global synchronization for nonlinear coupling complex networks, including NCMSCNs." Keyword : "Control rules, finite-time synchronization, linear coupling, nonlinear coupling, synchronization control. "